The Marriage Plot, or Not? Still, he also takes aim at these oh-so-earnest semiotics students. I cracked up when one says the “idea of social introductions is so problematized.” That is the word—problematize—to toss about in seminars on literary deconstruction. This remark also struck me because Eugenides spends the first pages of this novel introducing a literary hit list—Jane Austen, the Brontës, John Cheever, Collette, Charles Dickens, Theodore Dreiser, George Eliot, James Fenimore Cooper, Henry Longfellow, Anthony Trollope, John Updike, Edith Wharton, Tennessee Williams, William Wordsworth—only to follow this with a novel that intentionally challenges tradition. 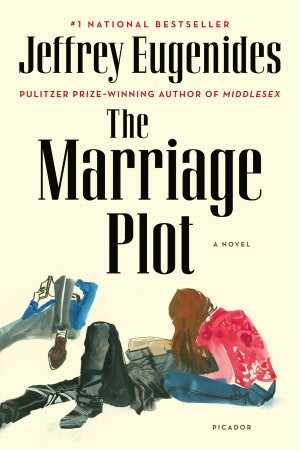 We know, of course, that he is questioning “the marriage plot” as a device, but Eugenides does not seem to offer up much plot wise in its place. Instead, this book feels as if it’s really about the writing. Much like a student in the Semiotics 211 seminar, I was less concerned with the storyline than with the words themselves. I found myself pausing to appreciate the masterful sentences, with little regard to their meaning. There is a love triangle starring Madeline Hanna, who is doing her thesis on “the marriage plot.” She falls for Leonard Bankhead, who eerily seems to resemble David Foster Wallace—though Eugenides denies this. The third wheel is Mitchell Grammaticus, a sort of variant of Eugenides himself in this roman à clef. Even readers who know little about literary theory can easily make a link between Mitchell’s surname and Jacques Derrida’s Of Grammatology, which the students revere as sacred text (ironic, given that Derrida argued text is meaningless). The novel follows these three from graduation at Brown through their first year in the real world—a literary Reality Bites. While the first half of the book reminded me of Lucky Jim or David Lodge’s satiric novels on academia, the second half seems to mirror Goethe’s The Sorrows of Young Werther—another canonical work that Eugenides spotlights. Like Werther, Mitchell suffers painfully from unrequited love as he searches to define himself. However, I grew impatient with Mitchell and his angst (just as I had done with Werther), especially in contrast to the real demons that haunted Leonard (and by proxy Madeline) in the form of mental illness. As such, Eugenides really brought to life Leonard’s torment and his daily struggles. Some readers have taken issue with this book’s conclusion which (spoiler alert) seems to suggest the “friends-with-benefits plot.” But, for me, the ending worked, both lyrically and literally. The last sentence seems to offer possibilities—especially for Madeleine. Unlike predecessors such as Sister Carrie or Lily Bart, she is not ruined by her associations with men. Nor is her fate sealed by marriage, like Dorothea Brooke or Isabel Archer. Madeleine escapes all of this despite the fact that she chooses to become a Victorianist (haha, good one Eugenides). Likewise, Mitchell escapes young Werther’s fate, though it is unclear whether Leonard does. In the end, both Madeleine and Mitchell stand on equal, if uncertain, footing. While this may not serve as the postmodern solution to the marriage trope quandary, it is certainly a refreshing plot twist. I enjoyed The Virgin Sucides and Middlesex, although they are a bit outside what I usually read, but dare I say this doesn’t appeal as much, am I wrong? I’ve been meaning to read this book for a long time, and your post makes me think I should move it higher up on my list. Thanks for the recommendation! Whoa – I own this book yet unread and this review is telling me it is WAY over my head! But I will read it anyway, someday, and not get any of the relations to past works and hopefully Inwill still like this author. Goodness.